I know I was going to try the dandelion dye on No-name’s fleece, but I couldn’t wait any longer. After all, the neighbors on both sides had mowed their yards days ago. We were looking pretty shaggy. 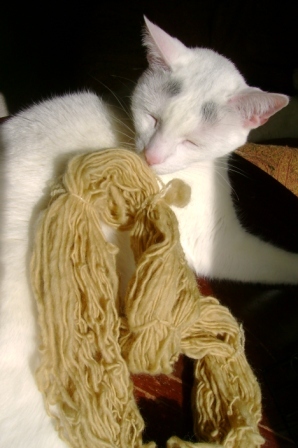 So, I found a skein of almost-white homespun wool yarn that had been ravaged by Newton and was considered, by me, to be unsellable. Friday became D-day. First, I went out to pick the dandelions–no stems, please, only heads. I felt like a grazing beast, hunkered over my lawn, snapping off the sappy, saffron flowers. Purposely did I wait until the employed neighbors had left for the day. I can only imagine what the retirees thought when they gazed out of their windows. Yes, I took the pot outside with me. Here is the harvest. Note the effect on my gardening gloves. To the pot I added enough water so that they floated easily and could be submerged with a spoon. In hindsight, I think less water would have made for a better dye. I then cooked said mixture for approximately 1 hour. The result looked brownish and smelled like weed stew. I strained the stew to remove the solids and kept the liquid. Meanwhile, I had been simmering my skein of mixed Corriedale handspun wool yarn in another pot along with 2 quarts water and 2 cups white vinegar, which would function as my fixative, or mordant. I let it simmer for about an hour, while the dandelion stew cooked. After draining the yarn, I put it into the dyebath and continued to cook at just below a simmer for another hour. I’m sorry I didn’t take a picture of this stage. I was convinced that I had just invented brown yarn, not the yellow I wanted. Since it seemed I had nothing more to lose, I left the yarn in the dye overnight. Saturday I drained the yarn, rinsed it in cold water, squeezed out the excess and hung it to dry. It was not brown, but there was a definite light-brown-ness about it. Then it dried and a tiny miracle occurred. Today I have a shade that is more yellow than tan. It’s rather nice if you like a subdued, natural shade of dark yellow. Take a look! You’re right, you know. (How’d you get to be so smart?) So here are two more shots. and another on a white-ish blanket. I probably should have removed the green hulls from the flowers for a more yellowy yellow. Dandelion dye leaves wool smelling like cooked weeds. Entry filed under: Dye. Tags: dye, gizmo. My yarn is in the pot of dye-water now (for over an hour so far), but it doesn’t seem to be absorbing all the dye by a long shot. Will it be better if I leave it to the morning? I indeed simmered with in a vinegar-water bath first, so I’m not sure what the problem is. I did dye playsilks a few months ago, so I was kind of expecting the dye to soak up quickly, so perhaps that’s my problem — your thoughts? 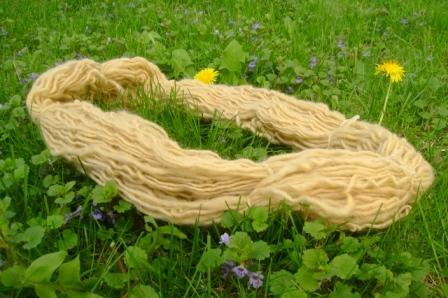 What is the fiber content of your yarn? Is it 100% wool? What kind of dye are you using? 100% Peruvian highland wool — I’m using Cascade 220 (not superwash), recommended at my LYS by a staff person who dyes. I did have the dyebath in the fridge overnight, but I can’t imaging that’s the problem (I heated it to simmer the yarn afterwards). Should I add vinegar to the dyebath directly? I did soak/simmer the yarn in the vinegar bath for at least an hour before draining it and putting it in the dyebath. I appreciate your help! I don’t think refrigerating your dye bath should have caused any problems, as long as the dye was completely dissolved when heated. Try Googling “dyeing yarn vinegar dyebath” for more how-tos and hints. And let me know how things turn out!!! You are so generous to keep responding to my snarl. I’m using dandelions, of course! When I get home this evening, I will add vinegar directly to the dyebath (I’d soak-simmered the yarn separately in a vinegar bath yesterday.) and see what transpires. One of those helpful links also suggested adding salt if the vinegar doesn’t do the trick, so I’ll keep that up my sleeve. I really appreciate you mentoring me through this — thanks. 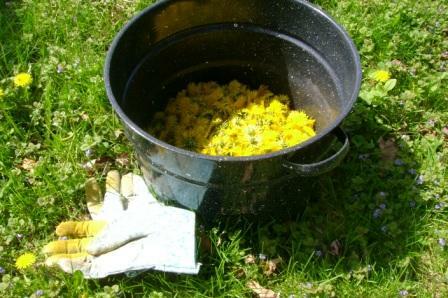 Your dandelion “stew” will still be stew-colored (greenish/brown) when you pull the yarn out. 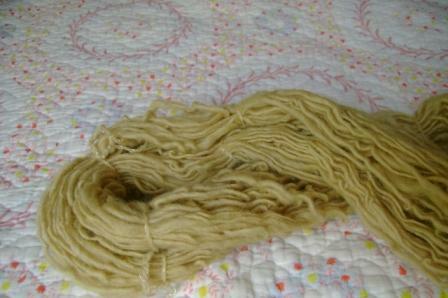 It will not clear out as the dye is absorbed into the yarn. I think this is normal for natural dyes, because it’s a different process than using man-made dyes.